It’s easy to sink into political depression these days. The news is bad, from the ongoing war against Iraq to the horrible bungling of the Hurricane Katrina relief effort, with all of its racist and classist implications. In downtown Managua, Nicaragua, dying banana workers are living in a tent city, under black plastic held up by sticks. Poisoned by Nemagon, a United States manufactured pesticide used on nonorganic banana trees, the workers are begging their own government for assistance for themselves and their families. Meanwhile, the U.S. government passes the Dominican Republic-Central America Free Trade Agreement, which will limit the banana workers’ rights even further, including taking away their right to sue the U.S. corporation that poisoned them. It’s clear that the governments aren’t going to fix these problems, at least not in the short run. People to people efforts are our best hope. As consumers in the world’s largest market, we have ability to improve the health and well being of our fellow workers throughout the world. By choosing to honor boycotts & buycotts (such as buying Citgo gas — wholly owned by the Venezuelan government and therefore not contributing to the greed and blood thirst of the United States oil corporations) and buying fairly traded products when possible, we can use our dollars more wisely. Opportunities to purchase fairly traded products here in Olympia have grown significantly in recent years. Downtown, The Old Bakery coffee shop brews only fairly traded coffee beans. The coffee shop is located just off the corner of 4th and Washington, in the first floor of the Security Building. The coffee they serve is roasted by Full Circle Olympia Coffee Company, and several of their roasts are available at the Co-op. Batdorf & Bronson, long committed to improving conditions for coffee producers through the Coffee Kids program as well as by paying a fair price, have recently certified some products with TransFair, the major United States fair trade certifying agency. These beans are now available at Batdorf & Bronson outlets as well as the Food Co-op. 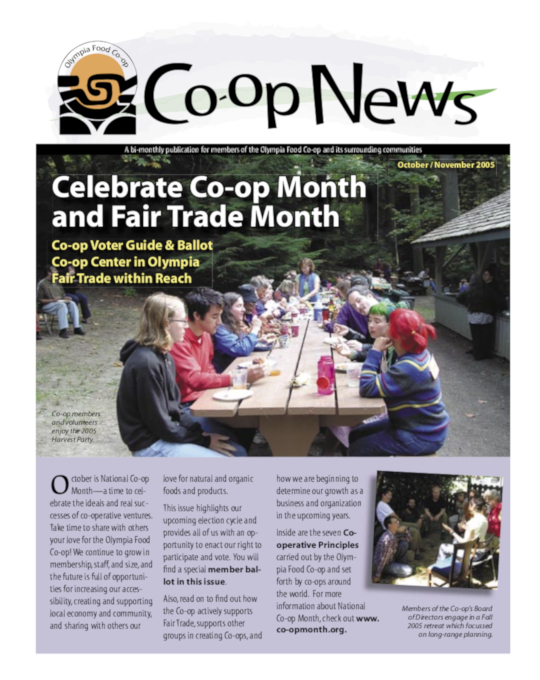 The Olympia Food Co-op has maintained its commitment to fair trade coffee for years. In 2003, I had the privilege of traveling with Equal Exchange to Coyona, Peru. Equal Exchange is the largest United States importer of fairly traded coffee from around the world. A worker owned cooperative, Equal Exchange works with cooperative coffee exporters who in turn work with base level producer co-ops. Coyona is a tiny town high in the mountains of northern Peru. All the residents of the community grow coffee, and all are members of the Coyona Coffee Cooperative. Together they own a small depulping and drying facility as well as trucks to transport their coffee to the processing facility. Coyona Coffee Cooperative is a member of Cepicafe, the export co-op located in Piura, Peru. Bananas, not only a great source of potas sium, are now available fairly traded at both Co-op locations. Mangos and several new chocolate bars also have fair trade certifications. The most exciting news, however, comes from Traditions Fair Trade. There you can find tee shirts and sneakers you can feel good about purchasing. In the retro style of Converse All-Stars (now owned and produced by Nike in sweatshops around the world), these “No Sweat” shoes come complete with a comprehensive labor co tent disclosure form. Produced by members of the Confederation of Indonesian Employees Unions, Textile, Clothing & Leather, the shoes were introduced in 6 locations in the United States, and Olympia was lucky to be one. Workers who produce these shoes earn a base wage that is 20% above minimum wage, a significant rice allowance, and 100% coverage of medical expenses (80% for family members). They also receive allowances for accidents, burial, maternity, meals, work clothing and shoes, transportation, gratuities, pension, and 8 weeks pay for Ramadan. Originally available only in black low-top style, the shoes now come in several colors, including pink, thanks to a collaboration between No Sweat and Code Pink, the organization of women activists committed to promoting peace and ending global corporate dominance. This summer I had the opportunity to visit the Women’s Sewing Cooperative of Nueva Vida, outside Managua, Nicaragua. Nueva Vida was established as a refugee community after Hurricane Mitch devastated Nicaragua in 1998. While aid money poured into Nueva Vida to provide emergency intervention, funding for sustainable economic development was not available. The intentional community known as Jubilee House asked Nueva Vida residents what they needed most. The answer came clearly: we need sustainable employment. At about the same time, Mike Woodard of Jubilee House and Bela Burda (owner of Maggie’s Organics) met by chance at a conference on organics. Originally committed to producing clothing exclusively inside borders of the U.S., Maggie’s Organics had lost several suppliers to bankruptcy. Additionally, they were increasingly aware that immigrant women, under conditions of indentured servitude, produce much U.S. made clothing in domestic sweatshops. Still, they were reluctant to move production offshore. When Bela asked Mike about his work in Nicaragua, she heard of the great need for sustainable employment in Nueva Vida. She asked, “Does anyone there sew?” Mike responded that some 40,000 Nicaraguans work in the textile industry in sweatshops in the free trade zones. Thus, collaboration was born. Jubilee House had identified worker owned cooperatives as a viable means to achieve economic sustainability. When Mike returned to Nueva Vida, he met with a group of women to discuss Bela’s proposal. The women were excited, yet unsure they could overcome the obstacles before them. First, they would need a building. Intimidated by the project, the women spent a week deciding whether or not to proceed. But once the decision was made, the women of the cooperative dedicated themselves to the construction project. They cleared the land, placed the supports, built the walls with concrete block, and installed windows, doors, and the traditional corrugated tin roof. Once the machines were installed, the women of Nueva Vida Women’s Sewing Cooperative knew they could realize their dream of sustainable employment. “I cry sometimes from happiness because of the strength we have,” said Zulema Mena, president of the Sewing Cooperative. In 2004, the Nueva Vida Cooperative attained another milestone – they received the status of a free trade zone. Free trade zone status gives manufacturers a series of tax breaks and access to lower import and export fees. This status is generally given to large multinational corporations who run sweatshops in the zones. Nueva Vida is the first cooperatively owned enterprise to receive free trade zone status. To read more about Nueva Vida, check out their web site at www.fairtradezone.jhc-cdca. org. And now, the tee shirts they produce are available right here in Olympia, Washington, and we plan to use them for the next run of Olympia Food Co-op shirts. To find out more about Fair Trade, please refer to the sidebar for websites and organizations of interest. Visiting the above mentioned businesses and viewing (or purchasing) products will also make the concept more tangible. Fair Trade actually allows you to feel good about shopping and more importantly, allows you to affect positive social change.